iSplash for Mac is an amazingly simple way to add a touch of class to your photos by converting everything to gray and then highlighting one aspect in color on Mac OS X. Its a technique that's often used in posters to stunning effect and iSplash makes you look like you're a pro when it comes to modifying images in the same style. iSplash for Mac supports PNG, JPEG, GIF, TIFF and BMP files and is extremely easy to use. iSplash is an amazingly simple way to add a touch of class to your photos. To edit a photo, simply launch iSplash, choose a photo using the file browser, or select one of the images that has been automatically imported from iPhoto. 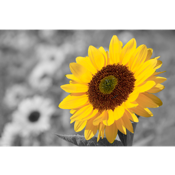 iSplash will automatically turn the image to gray and then you can select different aspects of the photo to turn to color. You add color using a spray can which does require a steady hand and can be quite painstaking at times. iSplash automatically restores color to the parts where you spray the brush. Save your photo and you're done! iSplash for Mac is a super simple way to add a stunning color/grayscale effect to your photos. Qweas is providing links to iSplash for Mac 1.1 as a courtesy, and makes no representations regarding iSplash for Mac or any other applications or any information related thereto. Any questions, complaints or claims regarding this application iSplash for Mac 1.1 must be directed to the appropriate software vendor. You may click the publisher link of iSplash for Mac on the top of this page to get more details about the vendor.